They say time flies when you are having fun and they are sure right ! We can’t believe it has been 15 years already (!) since our very first Star Warz party. We immediately started with big guns such as Ed Rush, Doc Scott, Andy C and many more … and you guys immediately picked up on that great Drum ‘n’ Bass vibe we all love so much. 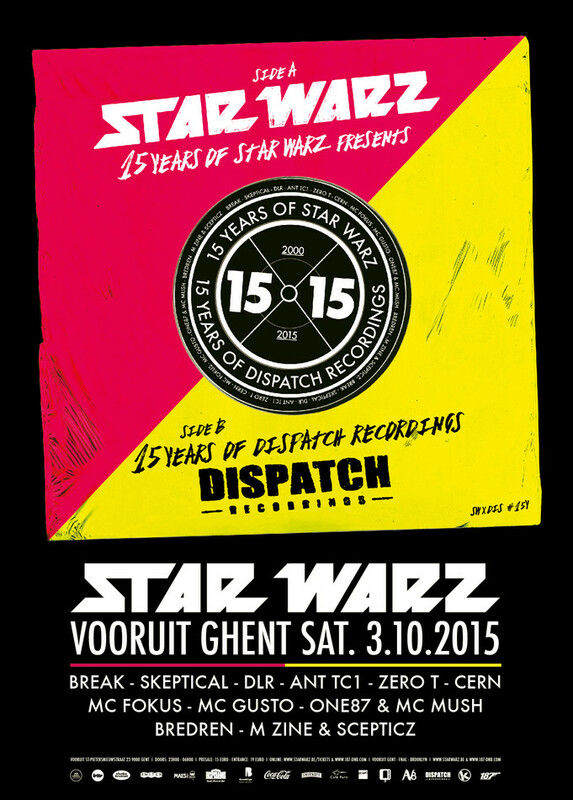 Star Warz quickly became a standard for Drum ‘n’ Bass in Belgium, thanks to the great crowd and to the point line ups. Soon we became the event of choice for label-nights, special anniversaries and much more. We had the pleasure of hosting many legendary nights such as several Metalheadz nights, 20 Years of Ram records, 15 Years of Virus Recordings, 10 Years of Exit Records, 10 Years of Shogun Audio and the list goes on. Synonymous with twisted bass lines and gut wrenching bass, Break has been unleashing his unique take on Drum ‘n’ Bass onto an unsuspecting public as long as Star Warz and Dispatch! Break has been heavily involved with some of the scenes most respected labels including Ram, Metalheadz, Shogun, Exit, Critical, Soul:R, Quarantine, DNAudio, Subtitles and Digital Soundboy. Launching his own label, Symmetry Recordings in 2006, Break honed and polished his sound with each single and released his fist album, also entitled ‘Symmetry’ in 2008. Also in 2014 and into 2015, Break’s ‘Duck for cover’ was yet another massive tune on Symmetry, while his version of Jaguar Skills & Chords ‘Lust’ destroyed venues around the world. With recent releases on Sigma’s ‘Life Recordings’ and more recently ‘Temptations’ on Symmetry, we’re all set for another huge year for Break. As a DJ and producer whose natural passion for music in all its forms eventually spilled over into a full blown production habit, Skeptical has been responsible for some of the most damaging yet delicate tracks occupying the realms of current Drum ‘n’ Bass. From the deadly ‘Blue Eyes EP’ on the taste-driven label that is Ingredients Records, to a slew of impeccable releases on highly esteemed imprints such as Exit Records, Dispatch, Renegade Hardware, and with releases on Soul:r & Samurai, Skeptical has smashed it out for almost every dark Drum ‘n’ Bass label worth its salt. Only the biggest of things are to be expected from a producer who has only just begun to give the Drum ‘n’ Bass public a tantalizing idea of his musical mettle. After various joint ventures on Dispatch from 2009 to 2012, 2013 saw J DLR step up to his solo career, and he is stepping up in a big way. Straight off the back of his album last year with Octane ‘Method… in the Madness’ which was in the list of top 5 albums of the year, with seminal track ‘Set up the Set’ making it into Noisia’s Top 10 for 2013 as well as endless airplay on Radio 1. The past couple of years, he went on a solo stance with releases on Metalheadz, Dispatch, Prolix’s Trendkill Record and the prolific Break imprint; Symmetry Recordings plus a remix from Spectrasoul’s recent album on Shogun Audio. From the start in 2001 Ant TC1 has not only been producing for Dispatch but also managed and owned the label. Next to that, he’s also the worldwide events manager for Metalheadz Recordings and programmer & artist management coordinator of the Outlook & Dimensions festivals in Croatia as well as co-event manager of Momentum at Wire in Leeds. Speaking of a loaded schedule... but just like us, he’s doing what he loves and it shows. Zero T started out way back in 1998 as a fresh faced youngster at Dublin’s now legendary Bassbin Night, supporting the likes of Ed Rush, Matrix and Fierce. By 2001 releases were coming thick and fast on labels like Subtitles, Commercial Suicide, Function and Advanced. Zero T and Calibre met before his 1st LP was done through mutual friends and this led to many joint-ventures with the little genius, notably the Waterfall 12″ on Signature which was a big hit in 2006. A year later Zero T relocated to London, working closely with Bryan G and Jumping Jack Frost’s V Recordings Camp, Artificial Intelligence’s Integral Records and an LP for Total Science’s CIA imprint. After touring extensively, Zero T is now plotting his next steps including releases on Subtitles, Shogun Audio, Good Looking, Liquid V, Integral and Metalheadz amongst others. Cern started producing for Dispatch in 2010 and after several Ep’s, his album ‘Under Another Sky’ appeared last year. The album has received support from the likes of Goldie, DJ Hype, S.P.Y, dBridge, Alix Perez, Om Unit, Lenzman, Jubei, Marcus Intalex, Doc Scott, Skeptical, London Elektricity and many more. He also appears on Project 51, Commercial Suicide, Uprising and Renegade Hardware. One of his last productions on Renegade is a collaboration with Maztek. All Dispatch artists will be accompanied by their favorite MC’s. Considered by many to be a relatively fresh face in the world of Drum ‘n’ Bass, MC Fokus is no stranger to the stage. As the MC of choice for some of the scenes best DJ’s & producers, Fokus has spent years building a strong name as a versatile host and competent lyricist. He is now the resident voice of Dispatch Recordings and Renegade Hardware. Since appearing on the critically acclaimed ‘Transit One’ album from Dispatch Recordings in 2011, appearing on tracks 'Red Mist', 'Gravity' (Dispatch) and 'Mainframe' (Renegade Hardware), MC Gusto is also increasingly in demand from producers to lend his unique voice and perspective to tracks from the deeper side of Drum ‘n’ Bass. And he’s also the standard Dispatch Recordings label host. One87, Star Warz resident, played over a thousand national & international dj sets, on all kinds of events, alongside many of the great names in Drum ‘n’ Bass today. Highlights include sets at Metalheadz @ Fabric and Cable in London, Shogun Audio @ Cable in London, Pukkelpop, Tomorrowland in Belgium, Atlanta and Brasil and off course Star Warz. He’ll be more than happy celebrating the 15th B-day of his baby and will do so in good tradition with MC Mush. Three good friends decided they had too much in common not to start working together and Bredren was born. Now, not even three years later, they have already released tracks on Dispatch Recordings, Proximity Recordings, Demand Records, Hospital Records, Break-Fast Audio and they gained the support of the likes of S.P.Y., Skeptical, Basher and many others. Their sound is deep, dark and minimal, but instantly recognizable, and that made them one of K-Mag's "20 to Watch In 2013". In the past you could have seen them hitting Outlook Festival, Sun & Bass and they have been playing all over Europe. In other words, these boys are spreading their wings and they are not messing about. Don't hesitate, and get your dose while you still can. Before M-Zine and Scepticz joined forces in Flander’s eastern fields, they were already well known figures in the Belgian’s dnb scene. Gainin’ more support from international dj’s & working on a daily basis in the studio, they cooked their way up to labels that keep innovating the Drum ‘n’ Bass sound: 31 Recordings, Dispatch Recordings, Samurai Music, Different Music, Demand records, .. Their career is on a roll and their dj sets are confident, very precise & will leave you stirred on the dance-floor. No time to party like on your B-day and now it’s ours and a big one, so please come and celebrate with us. It’s going to be out of this world!